Da Nang (VNA) – Up to 172 motorcycle riders, including eight women, will race in the second Yamaha Grand Prix Motorbike Race at the central city’s track on August 6. The event’s organising committee said that riders from clubs in 10 provinces and cities nationwide will compete over a tough 500m course located near September 2nd Street in Da Nang. Competitors will race on a zigzag track for nine laps in four categories of Yamaha bikes including Sirius, Exciter, Cygnus and 150cc sport bike. The Vietnam Cycling and Motor Federation said participants will compete in two divisions for amateur and professional racers, running from 8am till 4pm on August 2. It’s the second time that the race has been held in Vietnam for motorbike riders and athletes. 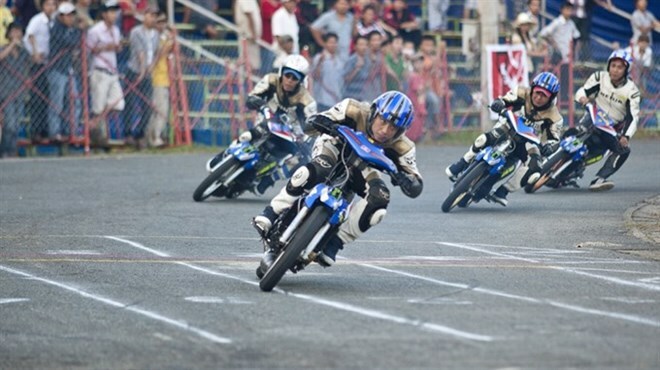 The first Yamaha Grand Prix was held in Binh Duong province last year with men’s and women’s riders competing in nine categories divided into three divisions for 115cc-, 125cc- and 150cc-engines for both professionals and amateurs. Da Nang also hosted the first Vietnam Motor Club Prix with the participation of 50 professionals and amateurs competing in two categories of 125cc motorcycles with two-stroke and four-stroke engines in 2012.